Nozoil. No more itchy nose. When you breathe through your nose you automatically filter out dust and pollution. And that’s a good thing, especially when you’re in a dusty environment or where there is air pollution. Your nose is also an efficient pre-heater and humidifier of the air you breathe in. 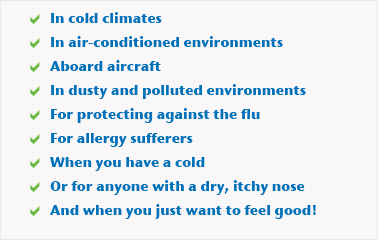 Which is also very good when you’re breathing in dry and cold air, just as you do in a cold winter climate. But breathing through your nose even improves your oxygen uptake. So your nose is much more use to you than simply sensing smells. It plays a vital role in processing the air you breathe by cleaning it, heating it, humidifying it and facilitating oxygen uptake. Breathing through the nose also affects well-being. Eastern yoga teachers have advocated breathing through the nose for thousands of years and this view is now widely accepted and endorsed by medical experts in the West. 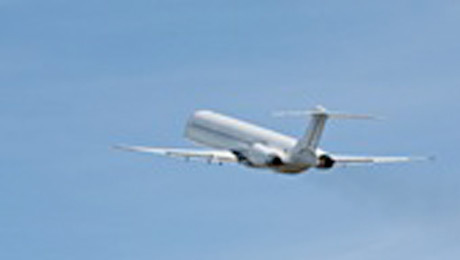 Nowadays more and more people are experiencing problems caused by	dry air. This has traditionally been the case in cold climates with low relative humidity, but the indoor climates that we live and work in today are increasingly regulated by air conditioning. Widespread use of electrical equipment such as computers makes the air even dryer. Cars today are also often air-conditioned and if you fly, you’ll already be familiar with the extremely dry air in the aircraft cabin. 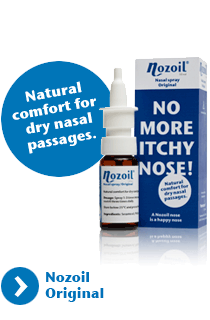 The dry air then dries out the mucous membranes and your nose becomes dry and itchy. Not everything can be blamed on the environment, however. As you grow older, and this applies particularly to women, your mucous membranes tend to dry out. In addition to that, some types of medication and surgical interventions in the nose can contribute to dry mucous membranes. You might not find that your breathing is impaired when your nose is dry, but you’ll certainly notice irritation and itchiness in the nose. And at the same time you’ll find a build up of dry, itchy deposits. These can impair the mucociliary function, meaning that the defence mechanism protection your nose hairs and nasal mucous provide is reduced. 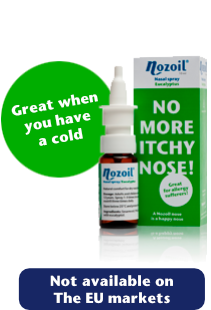 Once your nose starts to itch, it’s inevitable that you’ll start rubbing or even picking it. But did you know that 70% of the cold and flu germs that enter our body do so as people rub or pick their noses? So if you can avoid a dry and itchy nose you might also avoid the flu. Nozoil is made from natural, 100% purified and refined sesame oil. Sesame oil is a vegetable oil rich in vitamin E. It acts as an antioxidant and protects cell walls, preventing them being destroyed by free radicals such as ozone and nitrogen dioxide which are found in dry and polluted air. 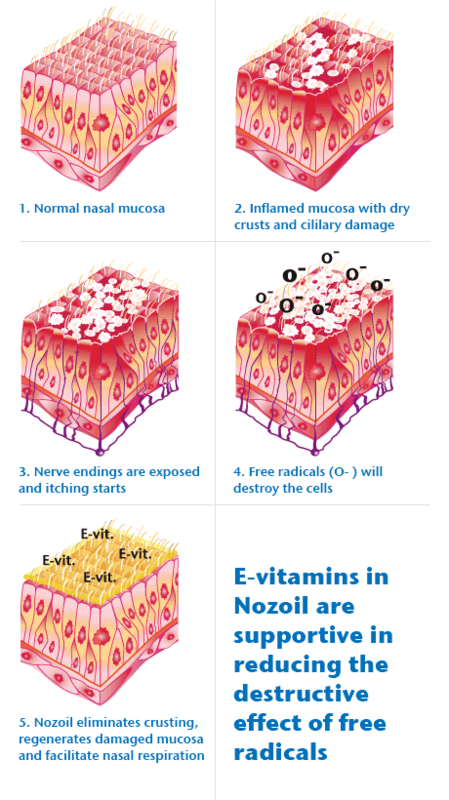 Nozoil contains no preservatives, so it does not harm the cilia in your nose. Nor does it contain any proteins, so it does not cause any allergic reactions. And the special applicator mechanism gets the soothing Nozoil deeper into the nose. 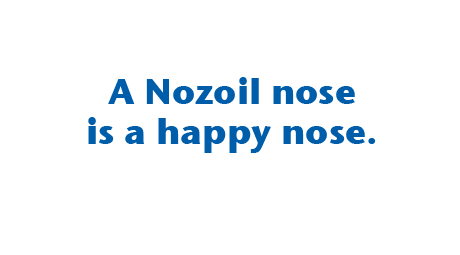 ® Nozoil is a registered trademark of Pharmacure Health Care International AB. 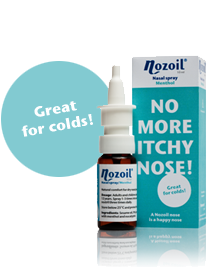 Nozoil is a natural, sesame oil-based spray that lubricates and soothes the nasal passages, eliminating itchiness, preventing the formation of dried nasal mucuos and helping support your body's natural defences against flu. Nozoil with Eucalyptus is great for allergy sufferers. Eucalyptol works gently to soothe inflammation and reduce irritation. 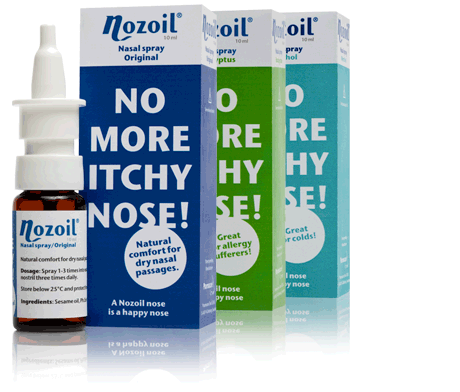 Nozoil with Eucalyptus keeps the nasal passages sufficiently lubricated to help minimize the adverse reactions allergies can cause. Nozoil with Menthol and Eucalyptol is great when you have a cold. Menthol gives a cool sensation of nasal airflow due to stimulation of cold receptors and has antibacterial activity. Eucalyptol works gently to soothe inflammation and reduce irritation. 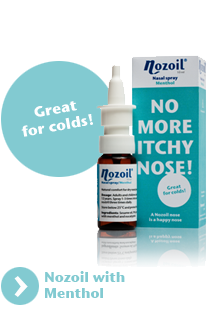 Nozoil with Menthol and Eucalyptol makes breathing easier, keeps the nasal passages sufficiently lubricated and eases discomfort when you’ve got a cold.